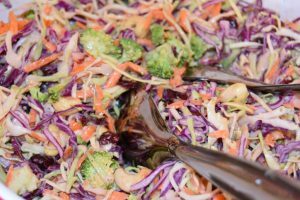 This is a lovely light slaw the mixture of vegetables gives great interest and the celery seed, cranberry and cashew nuts add little bursts of flavour, sweetness and texture. It’s always a hit when I make it at gatherings. Combine all of the dressing ingredients in a bowl and whisk lightly until you have a creamy dressing. 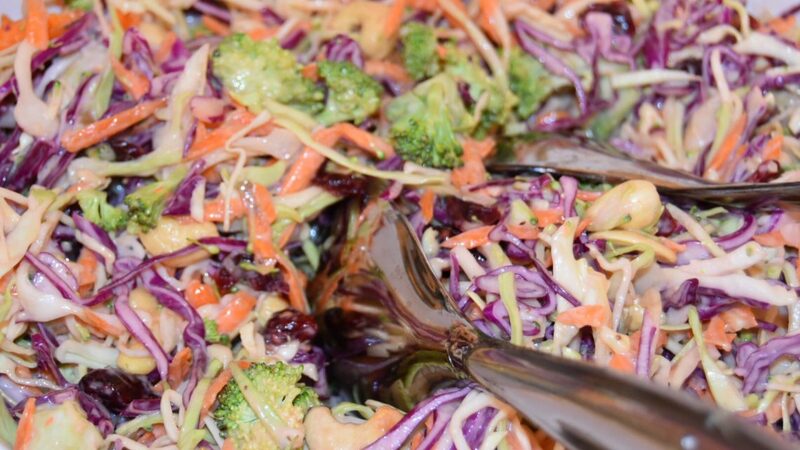 In a large bowl, mix together the prepared cabbage, carrots and broccoli, mix well. Pour the dressing over the vegetable mixture and mix well, ensuring everything is well coated. Top with the cashew nuts and dried cranberries and mix again before serving. Leave in the fridge for at least 1 hour before serving.